Find balloon sculpting ideas, balloon animals and twisty balloon sculptures here. Balloon sculpting is a popular clown trick, practiced with the aim of entertaining kids. Children just love the twisty balloon sculptures and balloon animals, which can also serve as an excellent party activity, for a child's birthday. Apart from that, they can be given as party favors, to your little guests. 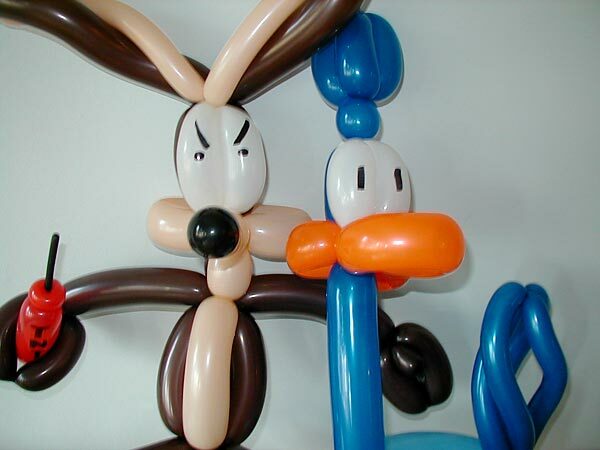 Some of the most popular balloon sculpting includes animals, such as dogs, cats, mice and monkey. Then, you can also find superhero balloon sculptures, the most popular of which include the Iron Man and the Incredible Hulk. Balloons can even be sculpted into simple hats, superhero hats or entire costumes. Kids simply love to learn how to make twisty balloon sculptures and can spend hours practicing the craft. These crafts are easy to make and not at all difficult to master. In other words, balloon sculpting can be easily learned by almost anyone. You can get several instructional packages in the market, to learn this art. These include instructional books, CDs, DVDs and other materials produced by different companies. And if you are even slightly creative, you will not need any teaching material as well. All you have to do is simply read our related section. Soon, you will be blowing up a few balloons and making your own balloon sculptures at home. Children simply love to play with balloon animals. Some of the most popular balloon sculptures include animals, such as dogs, cats, mice and monkey. Along with all these, the balloon fish also finds a special place. In fact, it is one of the basic animal crafts that a beginner can start with. Balloon fish is not very difficult to make. Balloon sculpture is an interesting craft liked by kids and adults alike. Beautifully hand-crafted balloon sculptures are the perfect decoration material for all occasions, whether elegant or pure fun. Make a personal impression with balloon sculptures at weddings, events, holidays, and kid's parties. Whether it's your friend's birthday or Father's Day, you want to gift something really special to these special people in your life. What about a smiley stress ball that can sit on their work desk, reminding them of you whenever they see it? These smiley stress balls are the perfect gift for every occasion. They can also be used as the decoration piece for your own room. Thanksgiving is an official holiday celebrated in Canada and US. On this occasion, people arrange dinner for their family members and friends. If you have also invited kids for dinner, along with their parents, then you have to think about few activities to entertain these little guests.